Take a look at these stories, and see what scientists had to say about them. The article is factually correct. The reality that Arctic sea ice is getting younger [rather than surviving for several years and growing thicker] is not so well known from the public, so such an article is welcome. 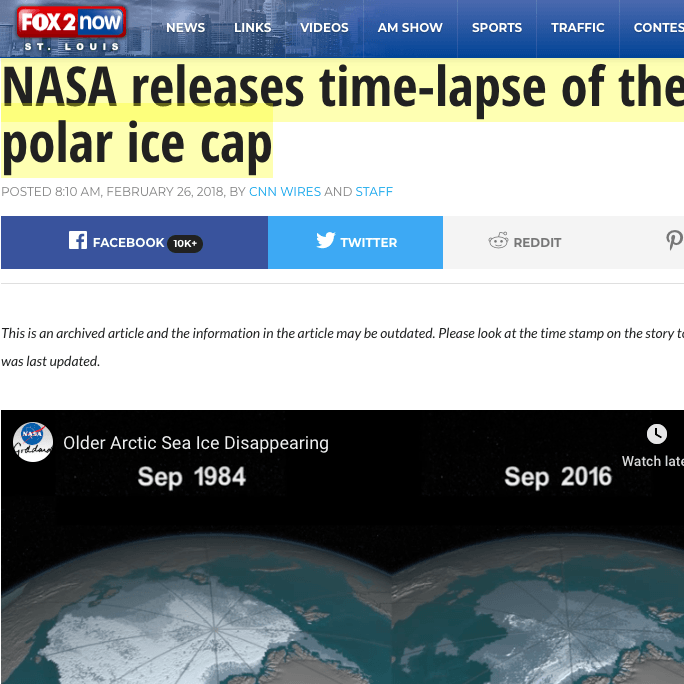 The article’s title and the front video are about sea ice, but most of the rest of the text is about global temperatures. There has been clear evidence that the two (rising temperatures and declining sea ice) are linked on long time scales (say, >15 yr), but interannual fluctuations of the latter are more difficult to formally relate to the former. The article is credible and the overall message/insight conveyed to the reader is accurate. The word “Avoiding” in title and text is overly strong and should have been “Reducing”. Adopting a vegan diet is not necessary, but a reduction to having meat 1-2 times a week and dairy 3-4 times a week would suffice. In fact, flexitarian diets utilize natural resources much more efficiently than vegan diets. In the article, Peter Alexander is quoted saying something to the same effect. 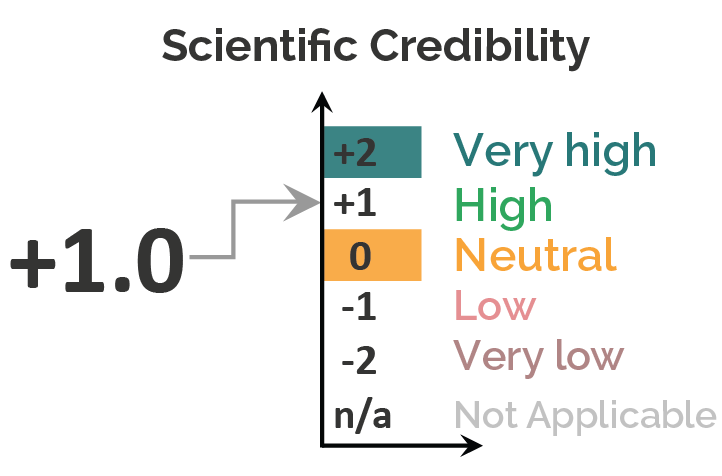 The underlying Science paper by Poore & Nemecek is using life cycle assessment. 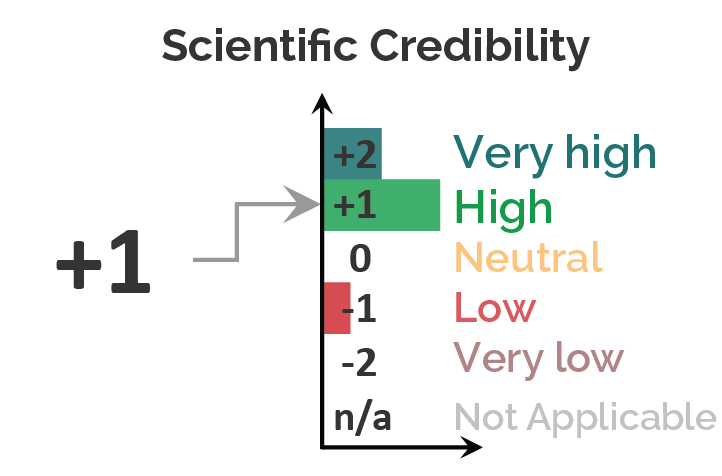 Life cycle assessment is an inherently arbitrary bookkeeping method and potentially misleading. Its caveats take a lifetime to fathom and some can and should be made explicit to lay people. To mention just one example out of many, expressing units per kg live weight, dry weight, or protein (or even cost, using economic allocation) makes a tremendous difference. As an illustration, try to compare cheese and milk. Such cautionary advice is lacking entirely. 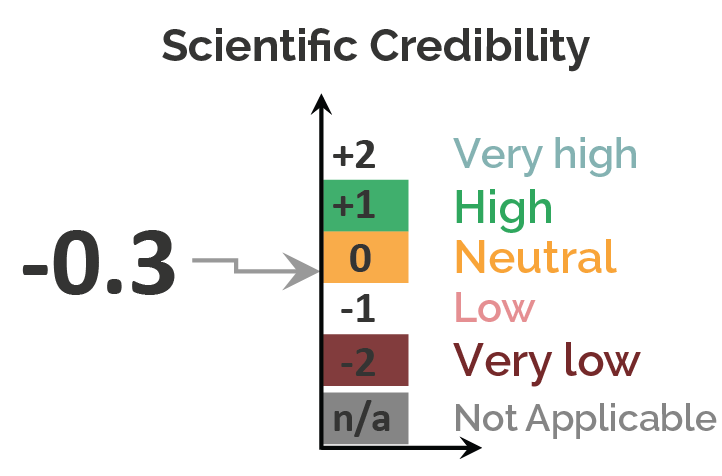 This article relies heavily on statements made by the authors of the covered journal article that are not necessarily supported in the journal article. 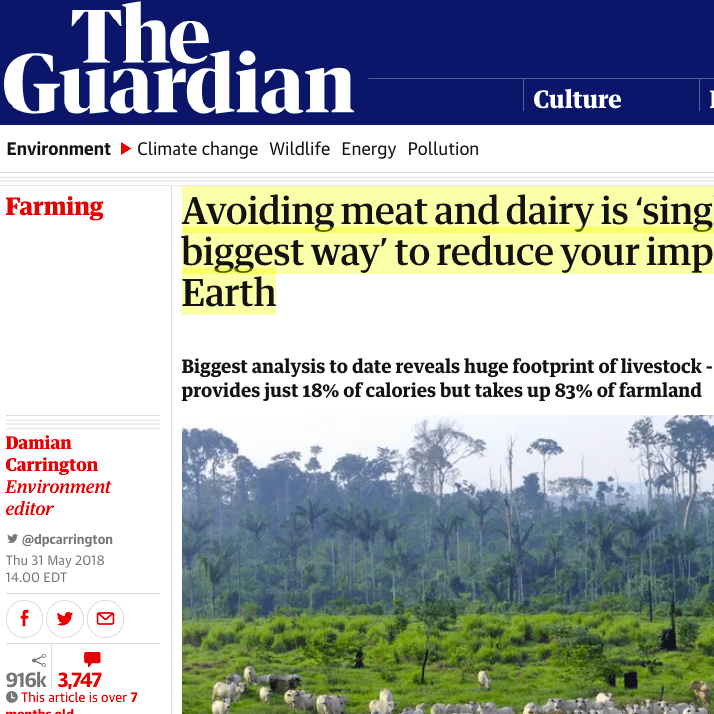 The statement “avoiding meat and dairy is the single biggest way to reduce your environmental impact on the planet” is not quantified in the journal article, but appears to be an opinion of Joseph Poore. More importantly, the main figure in this story is presented with the wrong units. The data on greenhouse gas emissions per unit of different food is reported in Poore and Nemeck as emissions per “100g of protein” from each food type, a critical distinction. It is also rather misleading (and confusing) to present the 90th percentile value as a datapoint and use that 90th percentile value as the reference (i.e., the comparison used in the figure title). Poore and Nemeck report means for all of these values: this would be a much more appropriate value to be reporting here. Scientifically, the article is overall correct, but it is in cases inaccurate in its description of certain aspects of the IPCC. 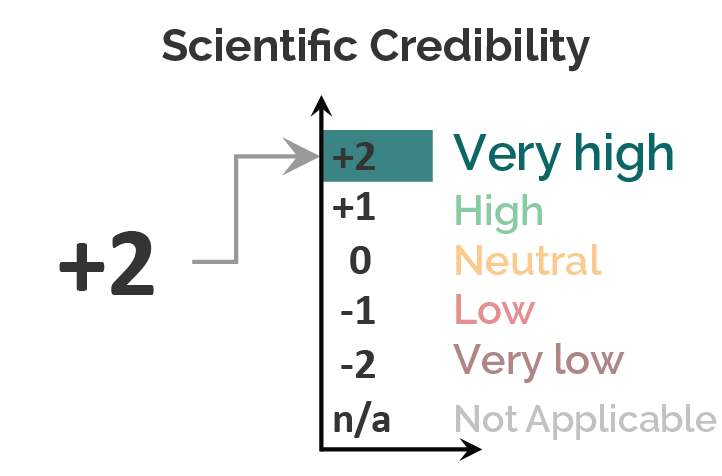 For example, the IPCC does not conduct research, but assesses the available scientific evidence. The article also provides statements without context, despite this being essential for their interpretation. For example, the annual investment needs in the energy sector for achieving a 1.5°C compatible pathway are indeed roughly 2.5% of global GDP, but this compares to about 1.8% of global GDP in a world in which we put the world on track for 4°C by the end of the century. The difference in investments is also roughly an order of magnitude smaller than the annual percentage of GDP we spend on energy. The absence of this context makes it impossible to judge whether the editor’s value judgment that limiting warming to 1.5°C would be “hugely expensive”. 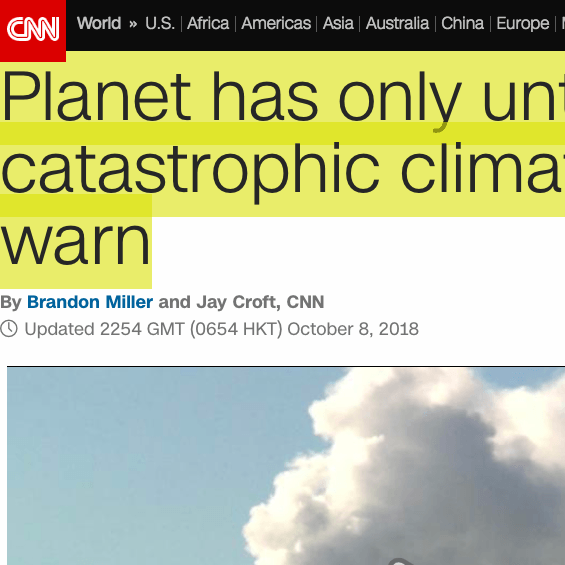 This CNN story covered the October release of the IPCC’s “Global Warming of 1.5 °C” report. 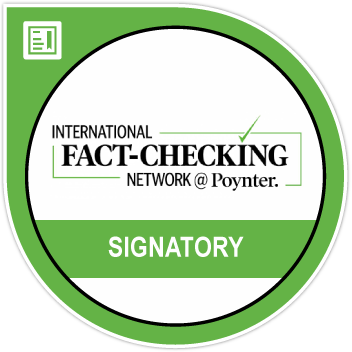 The report, which was requested by governments during the 2015 Paris Agreement negotiations, details the impacts of 1.5 °C compared to 2 °C and the emissions cuts required to limit warming to either of those levels.Scientists who reviewed the story found that it conveyed the information in the report without any errors, and included comments by scientists to summarize the report’s implications. 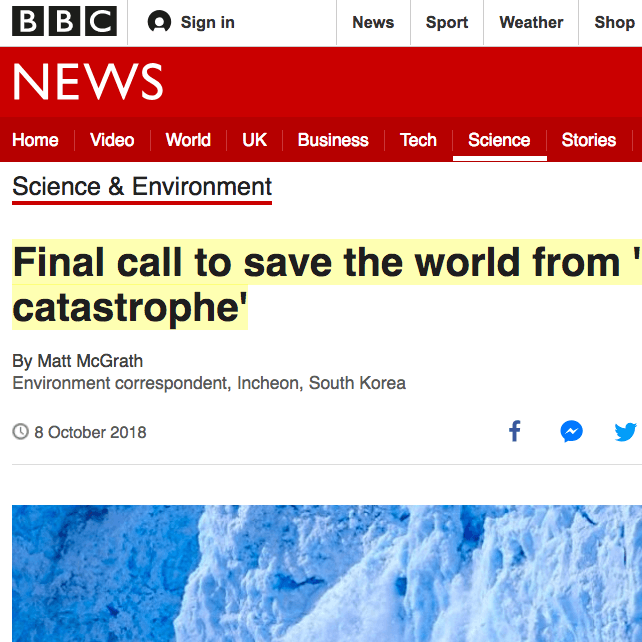 The article accurately summarises the IPCC special report on 1.5 °C of global warming. 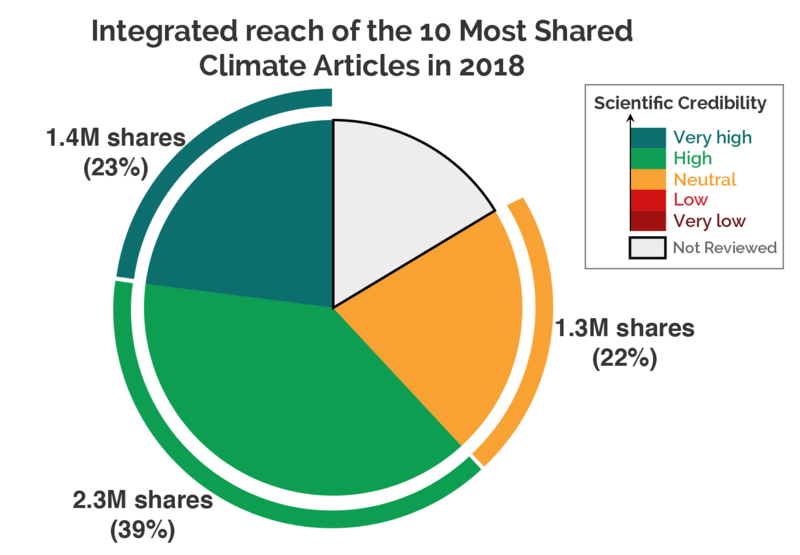 The article represents the key findings of the report and does well at highlighting the impacts of 1.5 °C global warming and discussing the difficulty in limiting warming to this level. This article was based on a UN Report regarding the impacts of climate change for 1.5 degrees C of warming. 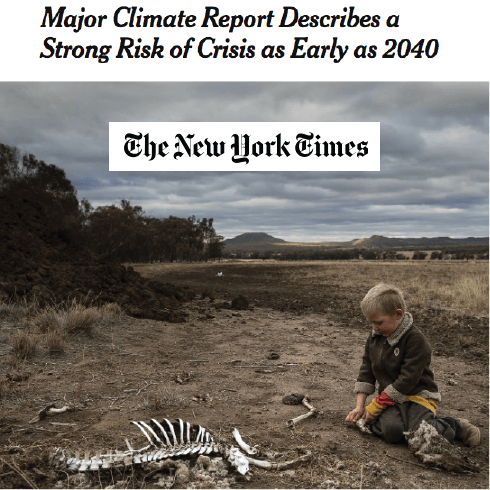 This was a very comprehensive article, demonstrating the broad range of risks that climate change poses, the scale of the action needed to mitigate climate impacts, as well as the roadblocks to action on climate change. 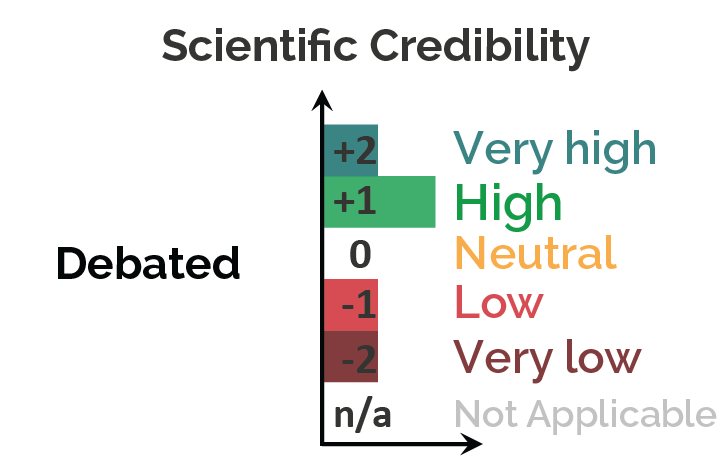 In general, the article did a good job surveying aspects of a large UN report. 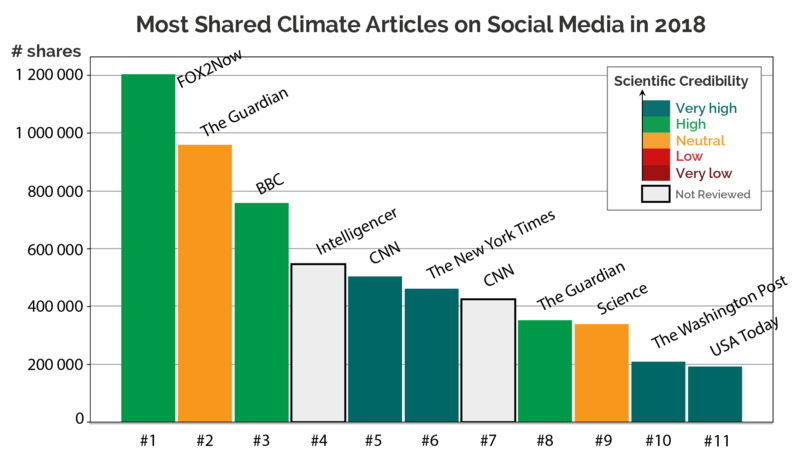 The article was overwhelmingly based on the science and evidence from the underlying UN report, but would have benefited from additional context for statements that claimed that climate impacts are more dire, are happening more rapidly, or with less global mean warming than previously thought. The article provides a rigorous assessment of the overall threats to the climate and the planet, as we are getting towards the challenge of feeding a 10 billion global population. 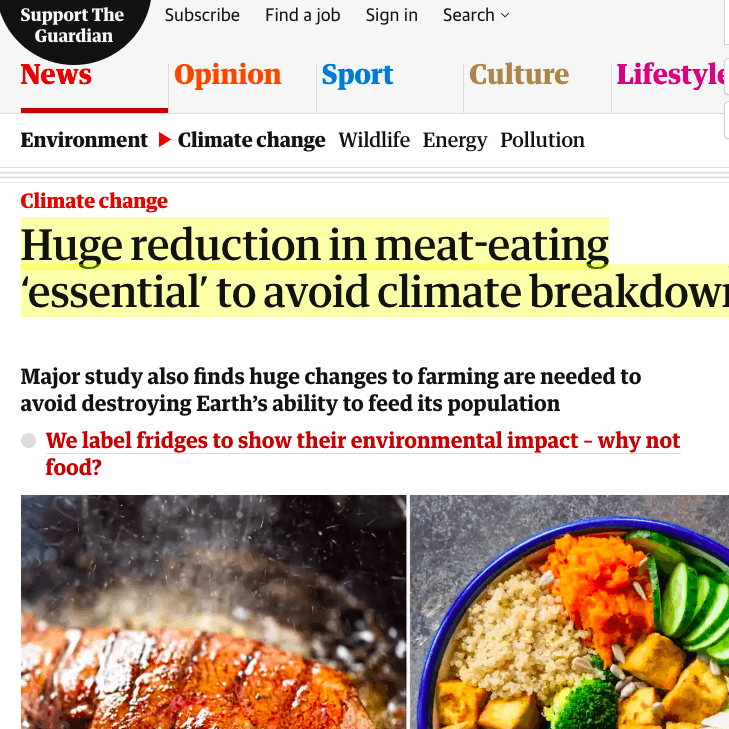 Change in diets will be required due to the high impacts of the livestock sector, but this is not the only lever to use to relieve the level of pressure, and the Nature study also heavily emphasizes the role of technical change, which is less prominent in the Guardian piece. It should also be reminded that most reductions of emissions on non-CO2emissions from livestock will be needed in developing countries (75% of ruminant emissions, 56% of monogastrics in 2000, see Herrero et al1). Therefore, reducing consumption in rich countries will only have limited impacts if developing countries do not join the efforts. The “flexitarian” diet is also certainly a more promising way forward than a vegan diet, due to nutrition balance considerations, and cultural barriers towards stopping animal based products consumption. The alarming tone could gain to be balanced with the diversity of challenges across different geographies, the role that technology could play to alleviate some adverse impacts, and the fact that climate mitigation in agriculture does not operate in isolation with other sector climate policies, which means the climate mitigation burden could be transferred across sectors and geographies to make the 1.5 or 2 degree C targets bearable for the food and agricultural system without jeopardizing food security2. 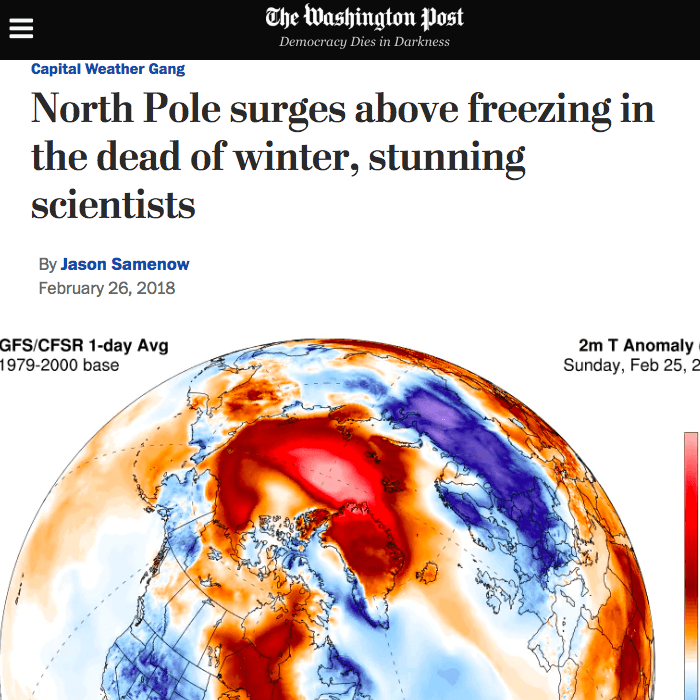 This article in The Washington Post describes a pattern of unusually warm weather in February 2018, during which the North Pole saw above-freezing air temperatures. 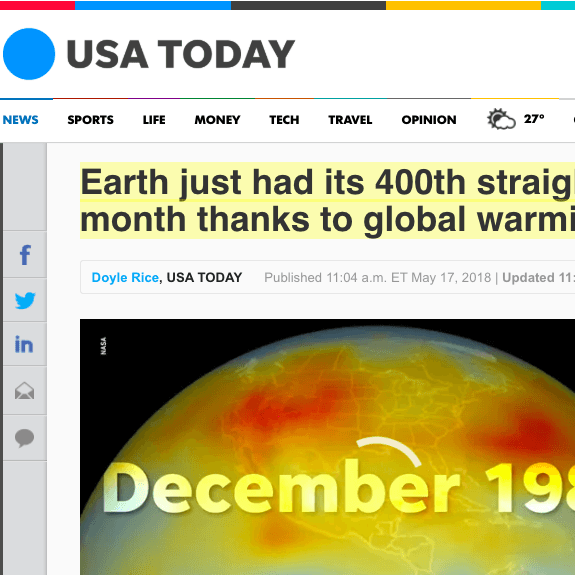 The article also places this event in context of past weather variability, explaining that there is an increasing trend of warm temperature extremes. 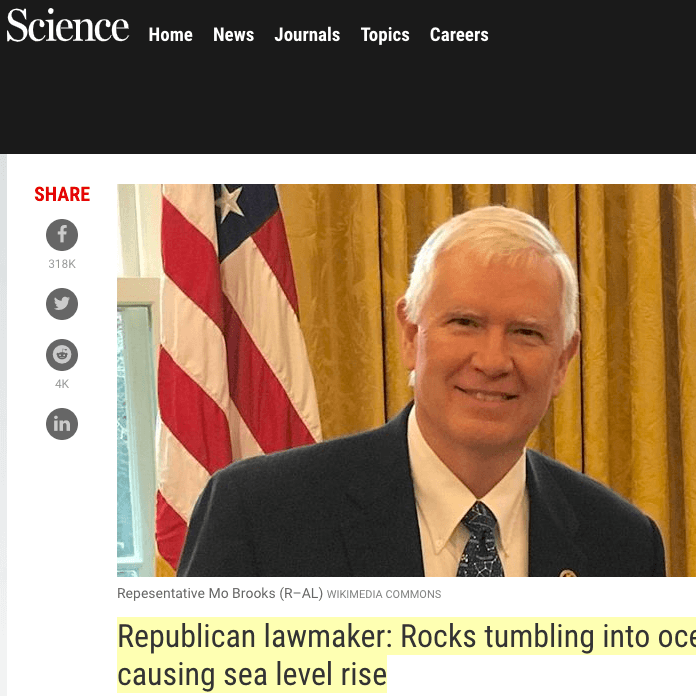 Scientists who reviewed the story found that it covered both of these points accurately. 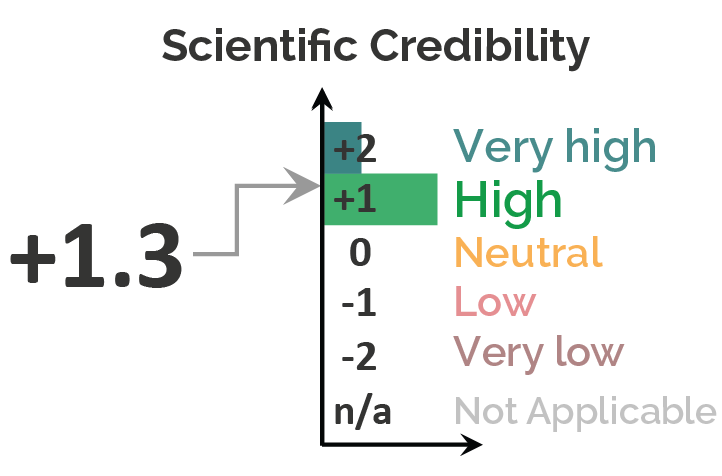 The trends are correctly identified without exaggeration, giving readers an accurate understanding of what the data show. This article accurately describes the Arctic warming event and associated surprise by scientists, includes multiple explanations for possible causes, and does not overstate any connections to climate change, pointing out that more data is needed to know if these above-freezing events will be a new Arctic normal.